It’s Friday, and that means another weekend of football is here! 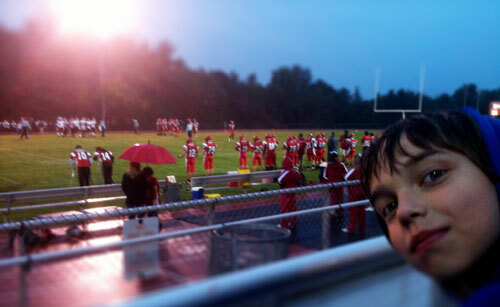 A week ago, Alex and I attended a high school football game here in our town. First time ever, actually! It was fun… except for the constant rain, on a cold night, and the college-ready, MJD-bodied running back on the other team… Still, it really was quite fun! We look forward to doing it again soon. It’s pretty much Buffalo Bills, and NFL football around here. So this week, the very promising, young Bills get to play their first game away from The Ralph. In two games at home, they have performed admirable, and at times, messily. Penalties, turnovers, dropped passes, missed passes, and in Week One, a CJ Spiller who forgot he was good. 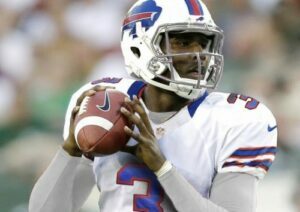 That has led to a 1-1 record, thanks to EJ Manuel and company pulling it together on the final drive. And also, thanks to a defense that looks… impressive. Even missing two of its best players: CB Stephon Gilmore and FS Jairus Byrd. Will that continue on the road? How much does the raucous crowd in Orchard Park aid this team? Can this young team with a rookie QB, and a rookie Head Coach, have the same—or better—success on the road??? We’re about to find out! Such a tough game to figure out. It would seem that the Bills have the edge in talent, and they have performed overall much better than their division counterparts. But both teams are young. The Jets have an established, veteran (mostly respected) head coach… but the Bills have the Jets’ former Defensive Coordinator! Ha! Really, should be an interesting matchup. Can’t wait to see it! I really think the Bills defense is improved. Six sacks last week. The backup corner backs are playing MUCH better than anticipated. Rookie LB Kiko Alonso was overshadowed last week by fellow rookie, EJ Manuel’s last minute drive to win the game. (And Stevie Johnson FINALLY catching the big pass!) Alonso is pretty great so far, actually. He ended the game by sacking Cam Newton, when they still had a (very small) chance to win that game. He also had an interception early in the game. And on offense … with a steady young, unflappable QB, a really talented group of wide receivers, and um… CJ Spiller and Fred Jackson? If they don’t hurt themselves with penalties and turnovers, this should be a comfortable win for the Buffalo Bills. The Bills, if they really are improved, and “heading the the right direction”—as most Bills fans think they are—really need to win this game. It’s against a division opponent, that has befuddled and annoyed them for years. This Sunday we could start to see that turning around. ← Winning Is All That Matters!